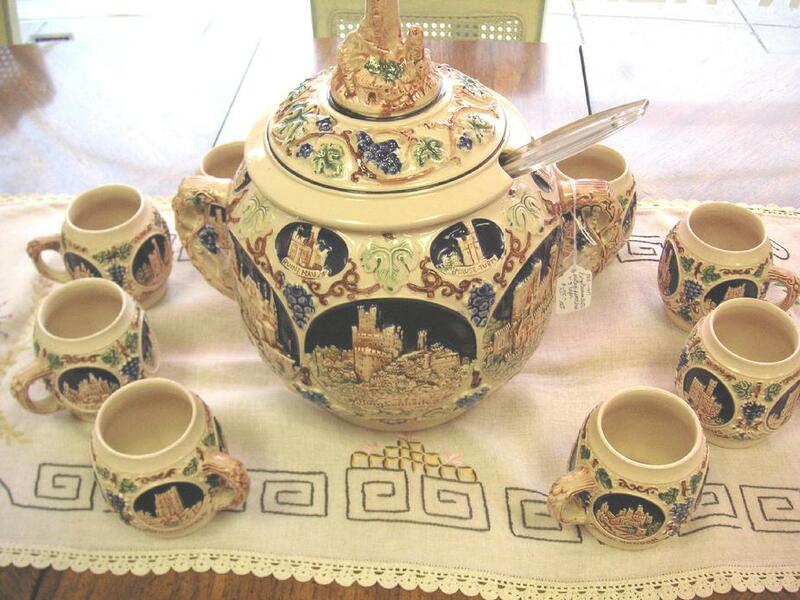 Amazing German stoneware covered punch bowl set! 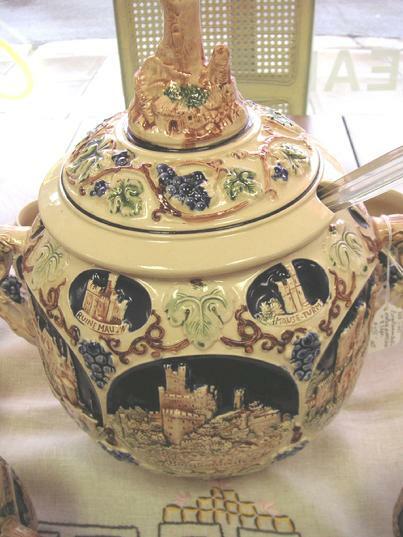 It is a "Gluhwein" pot traditionally used in Germany to serve warm mulled wine or rum punch at Christmas. It can of course be used as a traditional punch bowl or even as a soup turreen. 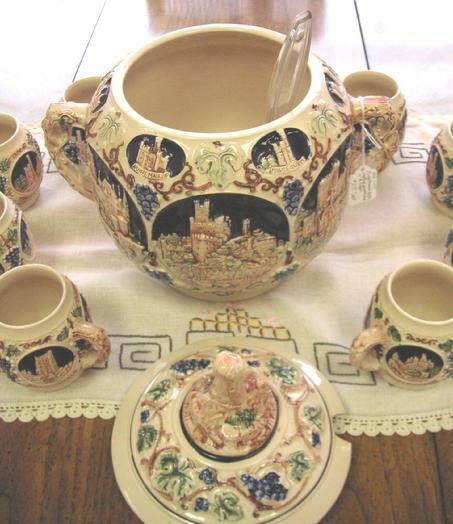 It is deeply embossed with grapes, leaves & vines & depictions of various castles on the Rhine river. Some of the castles include Drachenfels, Ruine Mans, Manseturm, Feindt Bruder, Marksburg, Burg Lachnech, Ruine Godesberg, Burg Katz, Burg Sonnech, Burg Rheinstein. It is in excellent condition with no cracks, chips, scratches or stains. It is perfect for gift giving, especially to that "hard to buy for" loved one. Buy it now! The Holidays will be before you know it?. It measures about 9" tall & 10" wide. It is very heavy weighing. The set also includes six (8) matching mugs or steins, each is 4" tall and one Ladle. Impressed with the Gerz trianlge logo and MADE IN GERMANY. 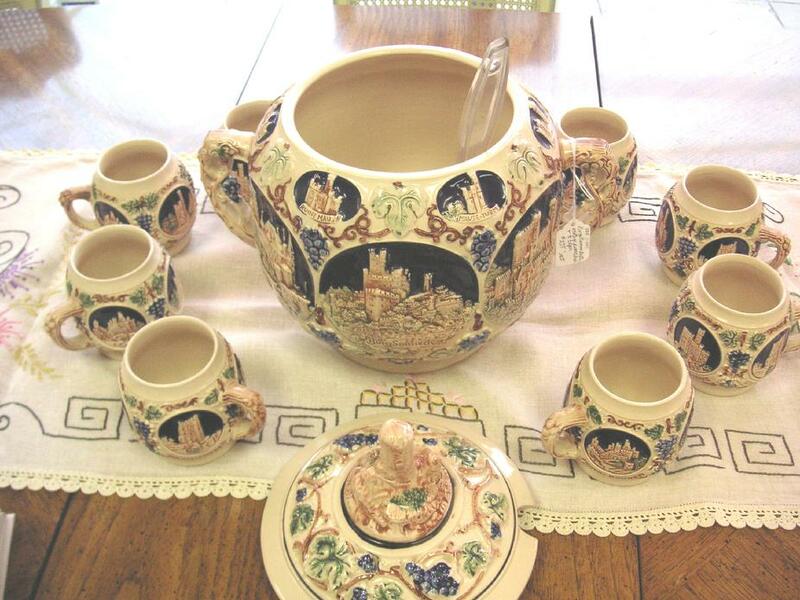 10pc Punch Bowl Set Stoneware. Our special offer $220.00 <?xml:namespace prefix = o ns = "urn:schemas-microsoft-com:office:office" /> Please look at all my pictures for details and feel free to email me at floydruggles@weststpaulantiques.com with any questions. Estimated Packed weight: 28 lbs 2 oz.